The Ornua PPI is at 105.0, which has held more or less steady since the turn of the year. Butter prices on the EEX Index are at record levels, at EUR 4,608/t. This represents an 87% increase on the same week last year. The premium of dairy fat compared to vegetable oil is also at record levels, which may encourage substitution. German retail sales in February were down 7.4% year on year. However, the growing trend towards natural products away from processed foods is clear. For example, Unilever recently announced its intention to offload their spreads and margarine brands with sales decreasing. The value of SMP compared to butter has fallen from 70% over a 5 year average to 45%. Despite an increase in SMP returns, the UK became the 5th country, alongside the Netherlands, Latvia, Germany and Poland to use intervention this year. Fresh stocks in storage are now at 6,554 tonnes. 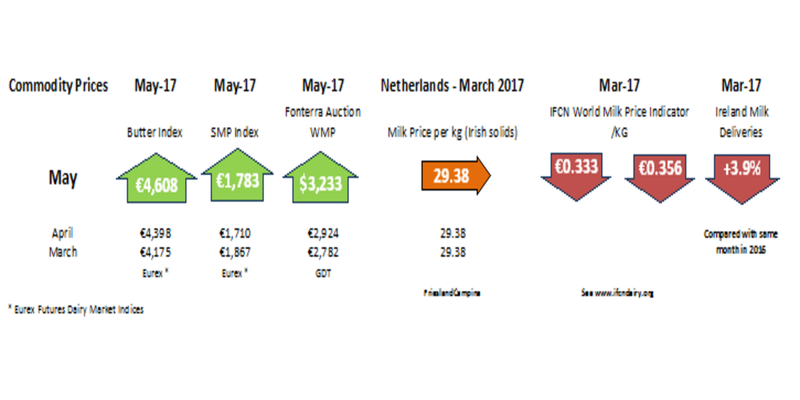 The overhang of 350,000 tonnes from 2015-16 represents approximately 17% of annual SMP trade and is 1.6% of annual EU milk production. 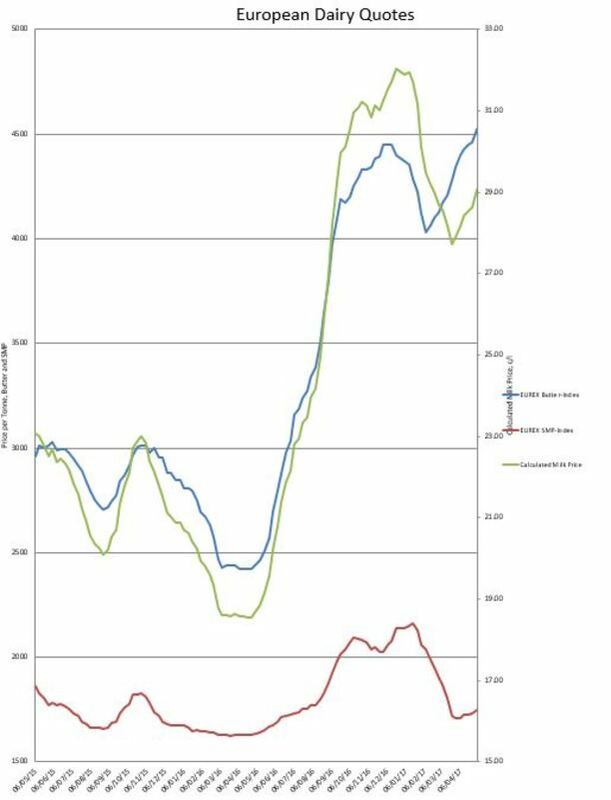 Weak SMP returns have a knock on effect for other products such as Casein and FFMP. The performance of the US dairy sector is another factor affecting the supply-demand equation, with March supplies +1.7% year on year. 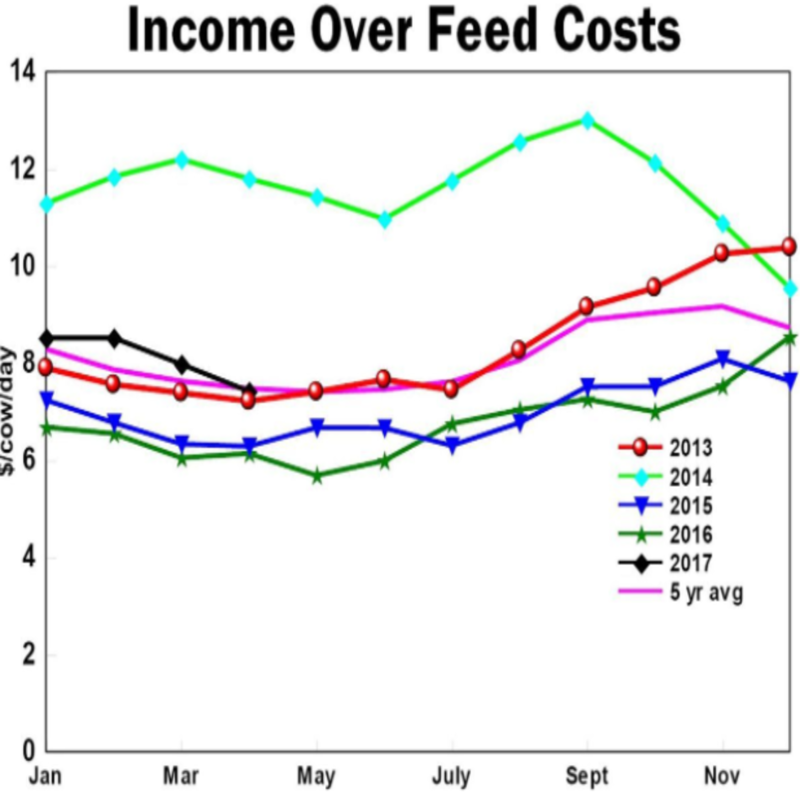 Record cow numbers, increased yields and low feeds costs are driving production. The loss of immigrant labour is a growing concern on US dairy farms should President Trump follow through on his Election promises. It is estimated that 51% of labour on US dairy farms are immigrants, many of which are illegal.